Ian Fleming lived in Kent during the 1950s, and his lifelong passion for the Garden of England certainly rubbed off on his most enduring character, James Bond. In the 1955 Bond novel Moonraker, the Secret Intelligence Service agent stops to gaze at the cliffs of Margate and the Isle of Thanet. Other Kent locations that Fleming name-checked in this novel include Dover, Maidstone, Canterbury, Wrotham Hill, Leeds Castle, the village of Swingate, and the old railway station known as Swanley Junction. The Kentish references go beyond Moonraker. In the 1959 novel Goldfinger, the golf club where Bond pitches and putts with the title character was based on a club in the Kent town of Sandwich of which Fleming was a member. Asked how he created his characters, the author once casually remarked that “I go out into Romney Marsh and hope to find one there”. Reflecting on this gnomic comment years later, the Bond historian Graham Rye, editor of the online 007 Magazine, studied an Ordnance Survey map of Kent and made some startling discoveries. In Romney Marsh he found a place called Moneypenny Farm, which had surely given Fleming the name for M’s secretary. Not far away was Honeychild Farm, a likely source for Honeychile Rider, the Bond girl played by Ursula Andress in Dr No. 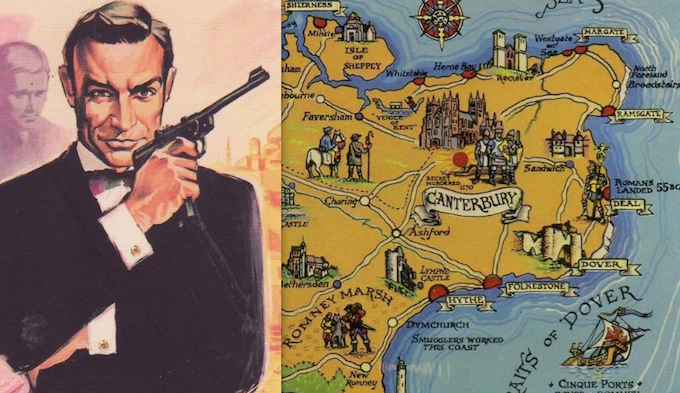 The curious links between 007’s adventures and Fleming’s best-loved county didn’t end with the author’s death in 1964. In the 1969 film On Her Majesty’s Secret Service, Tracy Di Vincenzo (played by Diana Rigg) tells Bond that she looks forward to “living as Mr and Mrs James Bond of Acacia Avenue, Tunbridge Wells”. (Sadly, there is no such avenue in this lovely old Kent town.) Actual Kent locations have been used to make other Bond films, such as Dover in Diamonds Are Forever, and Chatham dockyard in The World Is Not Enough. Share the post "FROM RAMSGATE WITH LOVE"
Your detective work is AWESOME.